Home » GenoPro Help and Technical Support » Using GenoPro - How to... » How to show mental illness, illness, alcoholism, etc. Can someone please tell me how to get the cause of death such as cancer to show on the genogram? Also, how do you get mental illness and alcoholism to show? Also, how do you add an adopted sibling? Thank you! You have to manually assign the colors using the Display tab. Hi, I am using genopro 3.0.0.7. I am constructing a regular genogram, not a medical one. In the case of some individuals, I have signified a cause of death, such as cancer, by having a small colored box showing in a particular quadrant of their genogram symbol. I think I did this by selecting their genogram symbol and then clicking an icon on a toolbar. However, I no longer see a toolbar where I can click an icon that signifies an illness or cause of death. But when I open the View menu, I seem to have all of the toolbars displayed. So, after I select a genogram symbol for an individual, how can I signify an illness or cause of death? 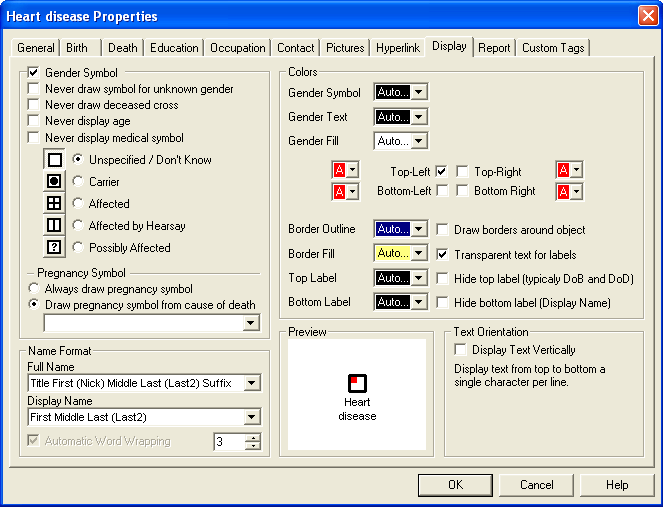 (I do understand that, for each individual's genogram symbol, I can set colors in the Display tab of the Properties dialog box.) Thanks! I have the same problem, part of the bar disappeared. Reinstallation does not work. Will there be more personel disorders, like ADHD or Autistisch or just mental illness? I use Genopro for social interaction-problems in the family. Not only medical problems, but rather social-relationship problems. It helps very well when they see a family-tree with a problem outside themselfs. Its less threatend. And when they see a problem in urly generations, it helps with accepting, which is the basic for changing!